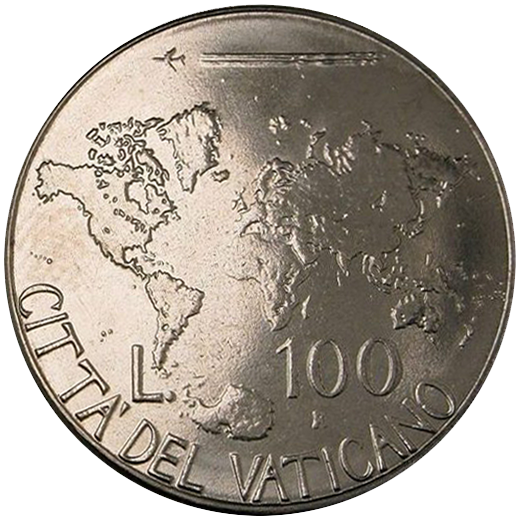 Pope's Chemtrail Depopulation Coin Minted By The Vatican in 1985 « Chemtrails: .... The Pope Francis Statement That Changed the Church. The fact this program is ongoing means that the "UK Ltd" Parliament and US Corporate governance is subservient to the NWO but regards itself above the people. Since the program is going on we must assume that every elected official that has denied existence of the program or not publicly denounced it is approving of the ongoing Genocide program! The parasite UNITED STATES Government took money, IP, resources to create the New Manhattan project off the American people - to initiate a global Genocide program. Evidence clearly suggests that it was initiated by the UN (Rothschilds - Rockefeller crime cartel orchestrated by the Club of Rome) which is the same Crime Cartel that owns the US Corporation and the FEDERAL RESERVE crime cartel. While we do not subscribe to the notion that anthropogenic Global Warming ever existed and needs dealing with, we do subscribe to the fact that there is more than enough evidence that a small band of criminals has taken control of our world and is engaged in a Genocide and Omnicide program. Chemtrails and EMF/HAARP are major Silent Weapon modalities of the program. Further IDP does not believe regular humanity made the planet sick - the NWO made our planet sick through Geo-engineering - HAARP deliberately as a means of a Problem - Reaction Solution / Hegalian Dielectic to suggest that global governance needed to do something to combat a non existent threat by engaging in a Genocide program. Solar Radiation management is therefore a camouflage program to fight manufactured Global Warming - FALSE THREAT! The last presentation on the page includes some great info... also touches on Alternate energy technology that already exists and has been suppressed for it will mean the controllers cant control humanity if we have free energy systems! Many are working on the challenge and many are known to have developed solutions over the last 100 years some of home were terminated by the cabal parasites! Notes from Skyguards EU Presentation of April 8,9 2013 can be found below the following post. The Belfort Group website contains a review of the forum (-) A second post in English is here. On 8 and 9 April, some 150 European citizens together in the European Parliament in Brussels in order to express their concerns in relation to the phenomenon known as GEOENGINEERING. They came from almost all European countries to Serbia, Ukraine and Cyprus are to confirm the creation of Skyguards, a collaboration platform for both individual citizens and civic associations. The Belfort-group was well represented because they have been in this field is very active, eg by organizing the first international chemtrail symposium and the publication of the “Case Orange”, a 300 page. constituent scientific document prepared by insiders of the military and civil aviation. Geoengineering is the worldwide artificially influence the weather. This is done by means of very powerful electromagnetic radiation from HAARP installations, the most important is in Alaska (USA). By editing the atmospheric layers, one can determine in which areas it is dry, where and how much it rains, you can steer hurricanes, etc.. In 1999 already, the European committee of environment and health a hearing for this was created, but that has died a quiet death because none of the managers of the HAARP facility in the U.S. was willing to come and give an explanation …. To make the atmosphere more conductive planes spraying daily masses of heavy metals in our atmosphere. This phenomenon is commonly referred to as “chemtrails”, but since this name is automatically linked to “conspiracy theories” and therefore not taken seriously it was decided to raise the issue through the more accepted notion GEOENGINEERING ‘. This climate modification is a hot topic in both military bodies in civilian circles, it is intensely studied and there are a lot of money, personnel and technical resources invested. The aim would be to global warming under control. More and more it becomes clear that this is only a false and mendacious pretext. Why growing unrest and resistance in the population? Firstly because geoengineering is the main explanation why our climate is so totally off the hook, that abnormal temperatures and weather patterns are recorded and that the number of so-called natural disasters like hurricanes, earthquakes, explonentieel increases. This not only creates many direct material damage and human suffering, but also makes the food prices rise. The realization that in different places without democratic approval and control the thermostat of our planet is tampered can not but provoke resistance and protest. In the second place, that heavy metals such as aluminum and barium an unlikely major threat to the health of humans, animals and nature. Whoever opens his eyes can not but conclude that everything and everyone gradually becoming sicker and eventually die. Most of the tree withers away, the population of bee colonies in some places reduced to 10%. It is remarkable that all this is normal and certainly not considered alarming. Officially it is claimed that geoengineering is mostly being studied with limited experimental testing but in the Parliamentary Conference of Tuesday, April 9, the activists of Skyguards clearly demonstrated that there is a mountain of scientifically based evidence, which demonstrates that the really large scale and this increasingly in the last ten years. They have pointed out the numerous studies and reports including NASA, which demonstrate that the solar light (global dimming) in the last 10 years is reduced by more than 20%. The alarming analysis of water, soil and plants where high presence of heavy metals is recorded. Many patents, licenses and contracts of agencies and firms that aim to benefit from the enormous financial and military interests who can manipulate the weather and especially on what so often can be seen in our skies. Aircraft spray thick streaks that linger for hours and fanning into a white mist, while climatologists and weather forecasters misrepresent them as harmless “clouds”. The most disturbing is the undeniable Impact on human health. We refer here to the work of medical research journalist Desiree Rover, which you can view by clicking this link. The parliamentarians present were very impressed. Problem is that at this time virtually nobody thereof lie awake and hardly willing to take this issue seriously and investigate. Within the group of Skyguards, it was agreed to by citizens group to petition the European Commission to force a legislative proposal. It will also provide a variety of ways to exert pressure so that an independent agency of the EU is instructed to take samples in the air of those ‘persistent contrails’ in order to get any doubts about the existence of this crime against humanity. 26. Aluminium & barium• HAARP runs on ELF (High-frequency Active Aurora Research Project)• X-band radar scans organisms for barium• the aluminium in your system turns you into an ANTENNANOW YOU ARE A PERFECT COMPONENT FOR THESE TWO SYSTEMS TO WORK AGAINST YOU! 36. MOST IMPORTANT STUDY Middelveen et al., Morgellons Disease: A Chemical and Light Microscopic Study, J Clin Exp Dermatol Res 2012, 3:1Morgellons Disease: A Chemical and Light Microscopic StudyMarianne J. Middelveen¹, Elizabeth H. Rasmussen², Douglas G. Kahn³ and Raphael B. Stricker¹* ¹ International Lyme and Associated Diseases Society, Bethesda, MD² College of Health Sciences, University of Wyoming, Laramie, WY³ Department of Pathology, Olive View ­ UCLA Medical Center, Sylmar, CaliforniaAbstractMorgellons disease is an emerging multisystem illness characterizedby unexplained dermopathy and unusual skin-associated filamentproduction.We present relevant clinical observations combined with chemicaland light microscopic studies of material collected from threepatients with Morgellons disease. 37. Morgellons Disease: A Chemical and Light Microscopic StudyMarianne J. Middelveen¹, Elizabeth H. Rasmussen², Douglas G. Kahn³ and Raphael B. Stricker¹* ¹ International Lyme and Associated Diseases Society, Bethesda, MD² College of Health Sciences, University of Wyoming, Laramie, WY³ Department of Pathology, Olive View ­ UCLA Medical Center, Sylmar, California Our study demonstrates that Morgellons disease is NOT DELUSIONAL and that skin lesions with unusual ﬁbers are NOT SELF-INFLICTED OR PSYCHOGENIC. Some great info... also touches on Alternate energy technology that already exists and has been suppressed for it will mean the controllers cant control humanity if they have free energy! SO we MUST develop it asap! Golnect catalog - Vatican 100 Lire Chemtrails Coin 1985. 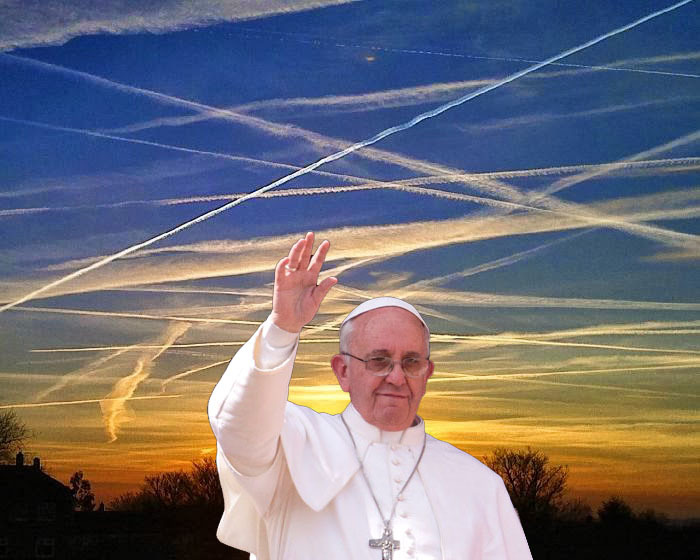 Pope's Encyclical Endorses Climate Change as Path to Depopulation The… chemtrailsplanet.net. 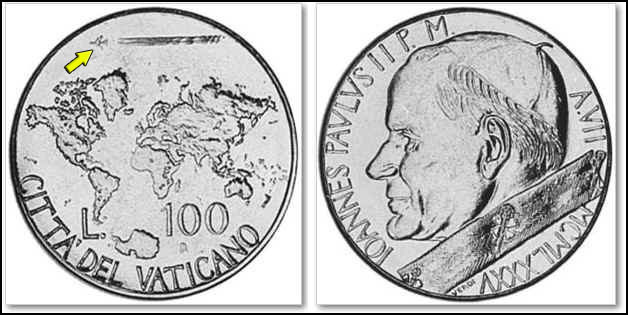 Jul 18, 2015 - Pope Francis and the Environment: Yale Examines Historic Climate ... side of a 100 Lire commemorative coin minted by the Vatican in 1985?